Our index slipped in November, retreating from its 2015 peak a month earlier. Inflation expectations weakened and wages disappointed. That highlights the challenges the Bank of Japan faces in achieving its 2 percent inflation target, despite Governor Haruhiko Kuroda’s optimism. Policymakers at the Bank of Japan have been disappointed by how slowly companies are raising pay despite a tightening job market, Reuters reported on Jan. 18. However, BOJ Governor Haruhiko Kuroda said he expected the economy to improve gradually. Japan’s consumer price index rose 0.3 percent year-over-year in November, Statistics Bureau data shows. However the Bank of Japan’s “core-core CPI” measure, which excludes both energy and fresh food, rose 1.2 percent in the year to November. Wages fell by 0.4 percent in November from a month earlier, according to Datastream. 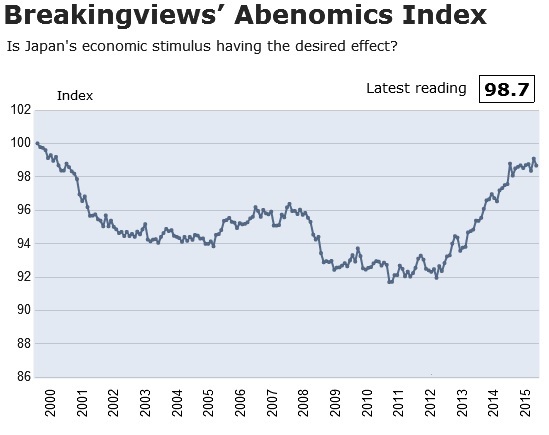 The Breakingviews Abenomics Index, an alternative measure of Japan’s economic growth, gave a reading of 98.7 in November, down from a revised 99.1 in October. Inflation expectations fell sharply in November. This indicator dropped 26 percent from a month earlier, according to Datastream. That was the steepest drop since February 2015. Inflation expectations are a proxy for confidence in Japan’s ability to increase prices. They reflect the difference between the nominal yield on fixed-rate bonds and real yields on Japan’s inflation-protected government bonds.